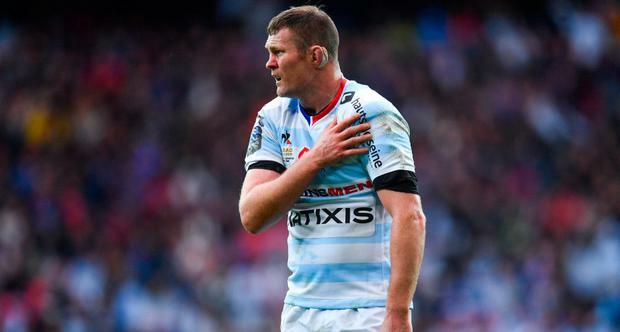 Racing 92 can have "no excuses" for their Champions Cup final loss to Leinster according to second-row Donnacha Ryan. The French side slipped to a 15-12 defeat to Leinster in the Champions Cup final in Bilbao this afternoon. Tipperary-born Ryan moved to Paris last summer after playing 13 seasons with Munster. Racing were unfortunate to lose starting fly-half Pat Lambie in the opening minutes, compounded by the fact New Zealand legend Dan Carter was forced to withdraw with injury just hours before kick-off. French international Remi Tales played the majority of the game at fly-half despite originally not being named in the match-day squad. However, Ireland international Ryan said his side could have no excuses, despite the disruption. "Credit to Leinster, they kept coming. It's very disappointing"
"Remi came in there and did a great job, it's obviously difficult conditions and he wouldn't have had many reps during the week. "They're no excuses, we've been playing together all year." Racing took the lead several times throughout the game before falling behind in the 78th minute to an Isa Nacewa penalty. Ryan lamented his side's lapse of concentration in the closing moments. "In the last 10 minutes we were still in control but unfortunately discipline let us down and there's no excuses for that. "They [Leinster] have ball retention ratings in the high 90's so we had to attack their breakdown and I thought we probably did that for the most part of the game, but we had to keep doing it for 80 minutes and we didn't. "It was obviously very disappointing but credit to Leinster, they haven't lost a game all season and they're obviously champions." David Kelly THE woman approached tentatively for the man was distracted by the sights and sounds that surrounded him.